This year, 960 residents from six sub-districts in North Jakarta have been trained by Industry and Energy (PE) Sub-dept. to get new industrial entrepreneurial skills.
" It is held since March 2018 and ended in August"
North Jakarta PE Sub-dept. 's Industry and ESDM Section Head, Moh. 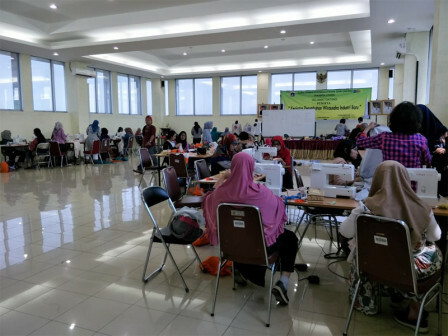 Zaeni mentioned, there are four fields in this training consist of processed meat product, handicraft design, fashion, and electronic service. "It is held since March 2018 and ended in August," he said, Wednesday (9/12). He explained, there are 40 participants for each fields in every sub-districts. Training is done in rotation for each sub-districts. After training, his side will provide a mentoring which is included in P3 stage and it will continue until P7 stage where new entrepreneurs will learn how to access capital. "We also have advanced training for participants who wants to learn processing food, fashion, design product's package, brand logo, and e-commerce. There also facilitates with halal and HaKI programs," he explained.